Until relatively recently some doctors would wrap patients in large bandages to prevent movement and agitation of the tissue following a cosmetic/reconstructive procedure. However, such bandages can interfere with everyday tasks. A compression garment is essential in providing appropriate support and compression that can easily be removed and/or partially released, when desired, without causing unnecessary abrasion, so that the user can perform normal everyday tasks. Applying compression will increase blood flow around the treated tissues preventing the excess fluid buildup (known as swelling), limit the risk of blood clot formation (seromas and haematomas), enhance the surgical result and speed up the healing process. The post surgical garments place gentle and even pressure around the wound areas to aid the recovery after cosmetic and/or reconstructive surgery, know as compression therapy. The macom® post-op garment range will cover all procedure types, and come in a variety of styles and sizes. Body procedures typically require a garment that extends from the breasts/chest to the mid or bottom of the legs. All body garments have openings at the gusset area to allow you to use the bathroom without removing the garment. 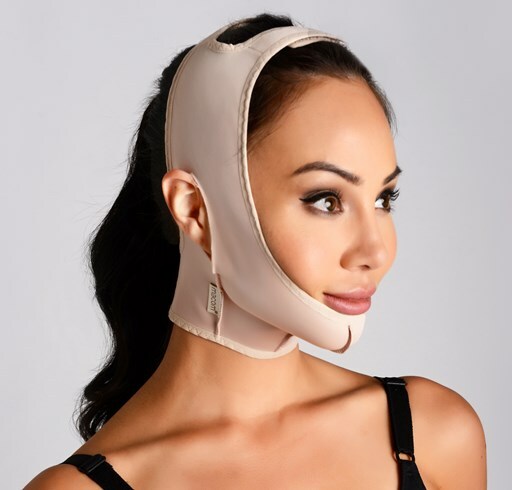 If undergoing a breast procedure such as breast augmentation, breast reduction, breast uplift and mastectomy, patients are then asked to wear a surgical compression bra. The macom® post surgery bra range offers a unique feature: the expandable cup, meaning that the cup of any macom® recovery bra will expand and mould to the new breast size. The post surgical bras are similar to a sports bra but with no underwiring (essential) providing more comfort following a breast procedure. The compression around the back and laterally means the post-op bra will give the required support. Ensure the size is correct by checking the macom® size guide. Compression should feel noticeably snug, but not so tight that it causes discomfort or makes breathing difficult. The compression should alleviate your pain and not cause more. It’s quite common for garments to become loose over time, as swelling subsides. For this reason, it is advised to purchase one size smaller too.